 This latest in the flourishing genre of post-Cold War triumphalism argues that the various covert practices of the Reagan administration hastened the demise of an already decaying Soviet empire. Schweizer (Friendly Spies, 1993), a media fellow at the Hoover Institution, spans the globe with the US foreign policy and national security establishment, demonstrating that for Reagan and Co. the best defense was a covert offense. They replaced George Kennan's revered foreign policy doctrine of containment with more aggressive policies, including a series of covert actions requiring the patronage of, among others, Saudi Arabia, Pakistan, the Vatican, and Israel. Through this strategic support the US promoted the mujahaddin in Afghanistan, Solidarity in Poland, and the Contras in Nicaragua. Schweizer's key protagonist is influential CIA director William Casey, and he asserts that Casey's furtive diplomatic operations--notably his drive to block the construction of a Siberian-Central European oil pipeline--played a major role in bringing the Soviet Union to its geostrategic knees. While avoiding lionization, he depicts Casey as a man of great character (interestingly, the book closes, save for a very brief epilogue, before the Iran-Contra catastrophe). Schweizer also bemoans the credit often given to the creator of perestroika, Mikhail Gorbachev, contending that the ``destructive'' work of the Reagan administration (i.e., its efforts to weaken the USSR) is insufficiently acknowledged. 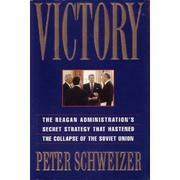 Only the Reagan administration, Schweizer posits repeatedly (often recycling evidence from earlier chapters), recognized the extent of Soviet economic infirmity and initiated covert projects in order to accelerate the Soviet Union's collapse. Schweizer's reliance, however, on a handful of interviews and dramatic re-creations of clandestine conversations and meetings (e.g., Casey with Saudi King Fahd, Casey at the Vatican to talk about Solidarity) renders his rather bold thesis suspicious. Worse, not a thought is entertained concerning the ethics or the possible illegality of many of these covert projects.